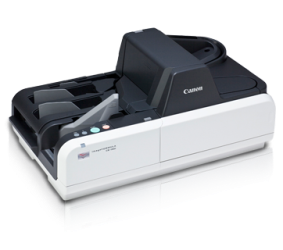 Canon CR-135i Scanner This high-speed digital cheque scanner boasts of superb MICR OCR capabilities in a sleek exterior. It reads the MICR line with remarkable precision, while reading the data simultaneously with OCR software. Designed for high volume output, handling loads up to 250 cheques at one time. With a document feeder that is intended to handle batch scanning smoothly and reliably, jam-free scanning is ensured. Users can also adjust the feed mechanism to accommodate different thickness of cheques. Accuracy is paramount in the cheque scanner domain. This mighty scanner reads the MICR line with a high precision Canon magnetic reader, ensuring cheque information is not compromised. It can also read simultaneously with OCR software.